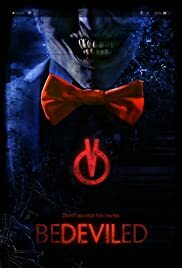 Bedeviled is the latest in a long line of cyber horrors featuring the standard young hot cast as they become besieged by a supernatural force spawning from a mobile phone application. Now though this hardly sounds like the best of premises it actually works, it's just not handled very well at all. Shortly in I thought that our antagonist had the potential to be a new much needed horror icon. He looks the part, he sounds the part and his method of killing is interesting and with room for some unique moments. The writers took the ball and ran with it, sadly they fumbled and dropped it at least half a dozen times en route to the line. With the right writers and a competent director this could be salvaged and made into a decent franchise, but I won't hold my breath quite yet. I'm not saying that Bedeviled is bad, it's just not what it could have been.